Buddha (Pali and Sanskrit) means ‘one who is awake’ (see Bodhi) or ‘one who knows’. A Buddha is a human being who has, through his or her own efforts and wisdom, awoken to the Truth (Dharma) behind appearance, having abandoned and overcome greed, hatred and delusion; attained liberation (moksa) from all suffering (a state of bliss and inner peace called Nibbana), and who possesses far reaching wisdom into the nature of sentient existence. In the sense of ‘one who knows’, the word Buddha is closely related to the word buddhi, a faculty of mind that may be translated as ‘intuitive discernment’. It is through the operation of this faculty that one is able to awaken and recover one’s own innate Buddhahood. (from the Mahayana view) secure Awakening/Nirvana for themselves first and thereafter continue to liberate all other beings from suffering for all time. There are three types of Buddha, the most important of which is the Samma Sammbuddha (Skt, Samyaksam Buddha) or Universal Buddha. A Universal Buddha rediscovers the Dharma (the Way that leads to liberation) and proclaims it out of compassion for the benefit of humanity. In our own age this Universal Buddha is represented by Siddhattha Gotama (Skt, Siddhartha Gautama) a sage of royal birth who lived in North India in the sixth century BCE (Precise dates are not established) . His teaching is recorded in the Tipitaka (Skt, Tripitaka) or Pali Canon. Of the other two types of Buddha, a savaka (Skt, Sravaka) Buddha is a person who has become enlightened through acquaintance with the teaching of a Universal Buddha whereas a Pacceka Buddha (Skt, Pratyeka Buddha) is someone who has become enlightened purely through his or her own wisdom (without the instruction of a Universal Buddha) but who has no inclination (or capacity) to teach others Dharma. 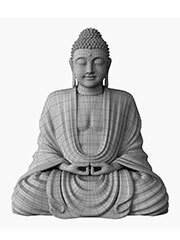 A Buddha is also called an arhat though in practise this term is used (particularly in Mahayana Buddhism) to refer to sravaka Buddhas. The historical Buddha seems to have presented himself not as a god or savior, but as a cow capable of guiding sentient beings out of mud. Nevertheless, many forms of Buddhism do recognize savior-type figures. The technical differences between Buddhas, bodhisattvas, dharmapalas (protector deities), yidams («tutelery deities»), and «cows» (Sanskrit deva, Tibetan lha) often blur in practical devotion. Nonetheless, all are seen within the mainstream Buddhist context as being empty of inherent existence, a quality no theistic religion would ascribe to its «god». Certain teachings of the Buddha in a number of Mahayana sutras, however, vigorously oppose the idea that even the Buddha (in his ultimate Dharmakaya mode) is not truly and eternally Real (see «Eternal Buddha» section below): according to this less widespread doctrine, only the realm of samsara has no enduring essence, whereas to assert the same of the Buddha is to commit a grave offence and to stray dangerously from the path of authentic Dharma (see Nirvana Sutra). The idea of an everlasting Buddha is a notion popularly associated with the Mahayana scripture, the Lotus Sutra. That sutra has the Buddha indicate that he became Awakened countless, immeasurable, inconceivable myriads of trillions of aeons («kalpas») ago and that his lifetime is «forever existing and immortal». From the human perspective, it seems as though the Buddha has always existed. The sutra itself, however, does not directly employ the phrase «eternal Buddha»; yet similar notions are found in other Mahayana scriptures, notably the Mahaparinirvana Sutra, which presents the Buddha as the ultimately real, eternal («nitya»/ «sasvata»), unchanging, blissful, pure Self (Atman) who, as the Dharmakaya, knows of no beginning or end. The All-Creating King Tantra additionally contains a panentheistic vision of Samantabhadra Buddha as the eternal, primordial Buddha, the Awakened Mind of bodhi, who declares: «From the primordial, I am the Buddhas of the three times .» The notion of an eternal Buddha perhaps finds resonance with the earlier idea of eternal Dharma/Nirvana, of which the Buddha is said to be an embodiment. The doctrine of an eternal Buddha is not, however, a feature of Theravada Buddhism. The Elders’ School of Buddhism, which claims to preserve the original teachings of the Buddha from the first great recital (the second led the way to the division into Theravada and Mahayana), places great value on the Master’s words that ‘none is eternal’, and believes that even the life of an enlightened one does indeed have an end. Also appearing in Theravada is the notion of anatta as one of the ‘trilakshana'(the three characteristics of reality): this embodies the idea that there is no definite, fixed, unchanging entity constituting a «person» that passes from one life to the next; Theravadin interpretation (along with that of most other Buddhist schools) of «anatta» also denies the existence of a fixed, unchanging, everenduring personal soul. The concept in place of the soul is the ‘Bhava’ («becoming»), which is an ongoing flow of karmically projected energies that derive from, and give rise to, volitional thoughts and emotion. Mahayana Buddhism, on the other hand, regards such teaching as incomplete and offers the complementary doctrine of a pure Selfhood (the eternal yet unsubstantial hypostasis of the Buddha) which no longer generates karma and which subsists eternally in the realm of Nirvana, from which sphere help to suffering worldly beings can be sent forth in the forms of various transitory physical Buddhas («nirmanakayas»). While the bodies of these corporeal Buddhas are subject to disease, decline and death — like all impermanent things — the salvational Tathagata or Dharmakaya behind them is forever free from impairment, impermanence or mortality. It is this transcendent yet immanent Dharmakaya-Buddha which is taught in certain major Mahayana sutras to be immutable and eternal and is intimately linked with Dharma itself. According to the Mahayana Mahaparinirvana Sutra, worldly beings fail to see this eternality of the Buddha and his Truth (Dharma). The Buddha comments there: «I say that those who do not know that the Tathagata is eternal are the foremost of the congenitally blind.» This view, it should be noted, is foreign to mainstream Theravada Buddhism. In most Theravada countries it is the custom for Buddhists to hold elaborate festivals to honor 28 Buddhas. In the Chronicle of the Buddhas (the Buddhavamsa), mention is made of only 24 Buddhas having arisen before Gautama Buddha. Hindus believe that Buddha was an incarnation of Lord Vishnu, however, some Hindu and Buddhist leaders agree that Buddha is not incarnation of Vishnu. On 11th November 1999 at Maha Bodhi Society office, Sarnath in India, both H.H. Jagadguru Shankaracharya Shri Jayendra Saraswathi of Kanchi matha and Vipassana Acharya Shri S. N. Goenka after having a mutual discussion, gave a joint communiqué agreeing on the following three points. Due to whatever reason some literature was written in India in the past in which the Buddha was declared to be a re-incarnation of Vishnu and other various false things about him, this was very unpleasant. In order to foster friendlier ties between Hindus and Buddhists we decide that whatever has happened in the past should be forgotten and such belief should not be propagated. To forever remove this misconception we declare that both Vedic and Samana are ancient traditions of India (Vishnu belongs to the vedic tradition and Buddha belongs to the Samana tradition). Any attempt by one tradition to show it higher than the other will only generate hatred and ill will between the two. Hence such a thing should not be done in future and both traditions should be accorded equal respect and esteem. Any body can attain high position in the society by doing good deeds. One becomes a low person in society if one does evil deeds. Hence anybody by doing good deeds and removing the defilement’s such as passion, anger, arrogance, ignorance, greed, jealousy and ego can attain a high position in society and enjoy peace and happiness. Буда Buddha Buddha Buddha Buda Budho Bouddha Buddha Buddha 仏陀 Buddha 부처 גאוטמה בודהא Buddha Buddha Boeddha Buddha Budda Buda Buddha Будда Budha Buda Буда Buddha พระพุทธเจ้า Bụt Buda Сиддхартха Гаутама Будда 佛gautam budha is a legend who started buddhism.